Envision what your business could be and you will achieve success, said one of the Million Dollar Round Table's panelists. Gaskell should know. For the former manufacturing executive turned business coach has repeatedly worked wonders at the various companies he’s restored to financial health or kick-started over the years. The lessons of his business successes were the centerpiece of a pre-reception lecture for top-producing life sales professionals at the 2014 annual Million Dollar Round Table, held on Sunday at the Toronto Convention Center. “Build a plan, share the purpose and opportunity with your colleagues, and become obsessed with team success,” he added. In 1987, Gaskell joined Porsche GB Limited and, four years later at age 32, became U.K. managing director. Inheriting a business that was verging on collapse, Gaskell transformed the automaker by refocusing on its engineering heritage and strengths; and, in the process, returning the company to financial health. While also restoring luster to the company’s tarnished reputation, Porsche, he said, was rated 33 in customer satisfaction when he started at the company. By the close of his tenure, the company had moved up to the top five in the rankings. He also boosted sales of the marquis sports vehicles from 45,000 to 80,000-plus. Gaskell achieved similarly impressive gains at BMW, where in 1996 he was tapped to serve as managing director. At the luxury automaker, Gaskell encouraged engineering team members to “challenge themselves to challenge the business.” End result: a 40 percent increase in sales and a 250 percent rise in profitability. Then in 2000, Gaskell departed BMW, first to head up CarsDirect.com (a pioneer in online car sales), then to kick-start epyx Ltd. Over the subsequent eight years, he helped to transform the company into the “UK’s leading provider” of e-commerce solutions for automotive fleets. The company’s competitive positioning enabled him to later sell the business for more than $200 million. What business principals and best practices underpinned these successes? The first of these, said Gaskell, is to “commit” — to dare to dream a vision of what the business could be. The next step is to “create:” developing a structured business plan to realize the vision, the latter shaped in part by the ideas of workers who will be executing the plan. And therein lies a distinguishing feature of Gaskell’s method. Too often, he observed, company executives fail to leverage the intellectual capital of their staffers. By tapping employees’ “genius within,” company management can “create the magic of shared achievement,” giving staffers a stake in a successful outcome. At Fairline Boats, a maker of luxury motor yachts that Gaskell has also directed as CEO, the foundation of the idea-sharing was a one-page business plan he prominently displayed on an “idea wall” and that was limited to 5 or 6 high-priority objectives. Any employee could add to the wall a suggestion for improving the plan or a process on which it depended. 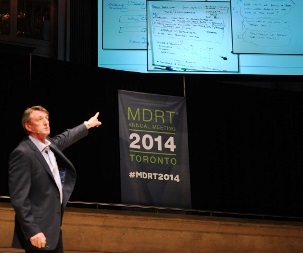 To judge by the attentiveness of Gaskell’s audience at the MDRT gathering, many producers will find his words of wisdom similarly invaluable to their own practices.